If you are using Google Apps then, you may have need to export crucial or all emails from your Google Apps account to your local drive because, backing up emails is a good habit. To do the same without showing any annoyance or problem, we devised Google Apps backup tool with brilliant techniques that help to create Google Apps emails, contacts, calendars & documents and save emails into EML, MBOX or PST file format. Both of these file format have their own facilities and advantages. Our Google Apps Backup Tool has simplest procedure to extract Google Apps emails into EML or PST file format. With our tool, you can save EML or PST at the desired location of your computer system. 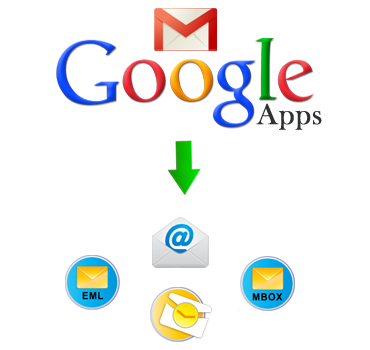 Using our Google Apps Backup Tool, you can extract multiple emails into EML MBOX or PST. Choosing EML, MBOX or PST is your choice but, it makes you comfortable for accessing your emails into Thunderbird, Eudora, and other email clients those support EML file format. On the other hand, PST files are easily accessible into Outlook email client. No matter which version of Outlook you are going to use, PST files created by our software accessible in all the editions of Outlook. The other benefit with our software is it assists to create backup of Google Apps emails that further signifies that your crucial emails are now protected by hackers. In any cases, if anyone hacks your account then, you have valid backup to revive crucial email data. Our Google Apps Backup Tool has simple and uncomplicated procedure to backup emails from Google account. Still, you want to check it out then, use freeware and after that move on for purchase. You can acquire one license from three named as personal, business, and enterprise. With trial version of our Gmail Backup tool, we give our users provision to test its ability. Get trial version that allows you to create backup first 25 items per folder (emails, contacts, calendars & documents) from Gmail account.